The material of our factory's scissors is mainly divided into the following kinds: high quality stainless steel 4CR13 comov 6CR13 comov, 9CR13 comov and the high-end quality Japanese stainless steel 440C which is world famous.All scissors are forging. 6CR13 belongs to Martensitic stainless steel which is the international number,The Martensitic stainless steel is used to product the knife and scissors.The Martensitic stainless steel grades are mainly 4CR13, 6CR13, 9CR13.Stainless steel has a certain hardness to guarantee the sharpness of scissors.The internal organization of the Martensite stainless steel is changed by heat treatment,resulting in the formation of tempered martensite.Through the process,the hardness of stainless steel is increased, then complete the production of the scissors.4CR13,6CR13 and 9CR13 Stainless steel are all high speed steel and emerging steel.CR is chromium,the higher the previous number,the more hard the more crisp,and not easier to rust. 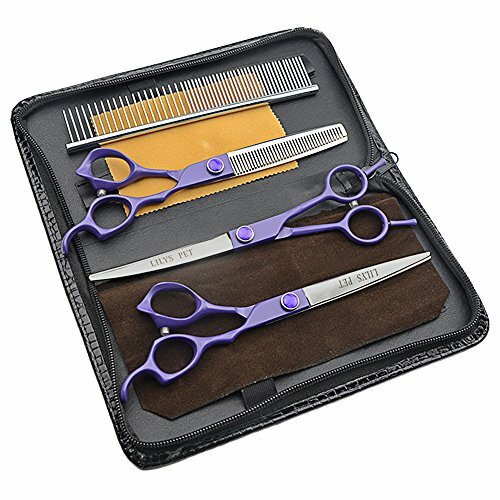 This pet Grooming Kit includes 1 Cutting scissor,1 Thinning scissor,1 Two-way Curved scissor,1 Hemostatic forceps,1 grooming comb,1 cloth and 1 scissor case.Right-handed scissors set. Size:7.0",color:Color:Purple handle.Thinning Scissor has 37 Teeth. Made of HIGH QUALITY 6CR stainless steel with beautiful screw for durability and style.Unique TEFLON paint technology. PURE HANDMADE, Delicate screw and silencer design,these detail designs show the high-end quality of scissor. Engineering structure design allows you to grip them very comfortablely and reduce the labor intensity of you.This design insures the minimum risk for repetitive motion injury.Ergonomically Curved/bent down finger thumb hole/ring to help reduce hand, arm,elbow, shoulder, neck and back problems.The product is made to the highest specification and is quality tested. If you have any questions about this product by LILYS PET, contact us by completing and submitting the form below. If you are looking for a specif part number, please include it with your message.